Continuing from the previous post, Customising a List form, we are now at the point when we can start to do something useful with these techniques as let’s face it adding hello world to a form doesn’t really add value. So in this post I am going to add a customisation to make the input forms new or edit a little more useful and therefore encouraging user adoption. The absolute height of usability that one. Is it better in 2010, my other dev box is off at the minute. Thing is we can make this better. 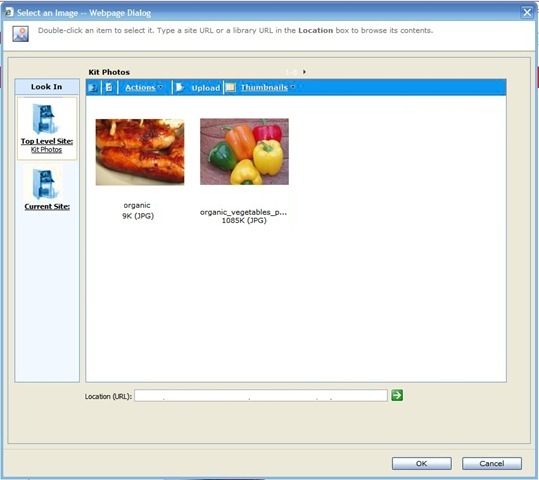 In my scenario the user needs to select an image from an existing Image Library. Below you can see the added hyperlink, the picture field populated and a preview image. The more observant will notice this version picks thumbnails automatically. The example code below relies on you determining certain things and setting the code constants to the values you have determined, e.g. the Image List Name and Guid, the jQuery field selector for the picture block, this is something that can only be done by rendering the form and figuring out the ID of that first text box of the field. Which locates an input box with the ID ending in “UrlFieldUrl”. The Real name, in my case, happens to be “ctl00$m$g_df4349ae_3a85_4882_93ef_c7c49eb75719$ctl00$ctl04$ctl07$ctl00$ctl00$ctl04$ctl00$ctl00$UrlFieldUrl”. I use that tag to automatically add the HTML for the “Click Here” link and determine the layout of the page for adding the preview Image. The code for the Dialog Picker is Standard SharePoint, the Asset Picker, and I took the idea from a blog post , in this chaps blog he is using it on a toolpart. So here is the code I use to implement this in a page.